The Daily Racing Form has reported that artist and longtime horsewoman Christine Picavet died last week at the age of 65, having lost her battle with cancer. 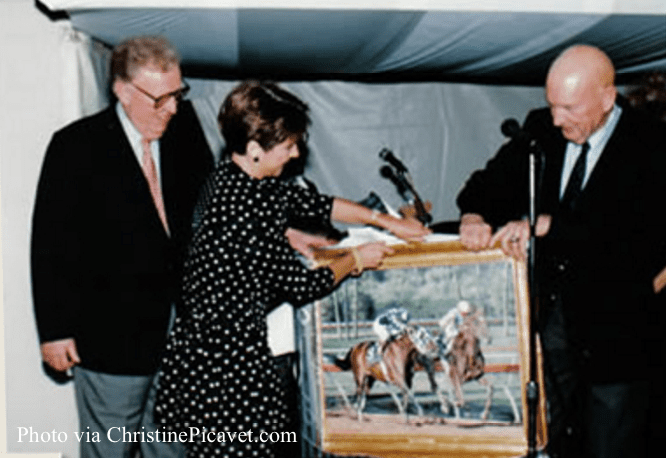 Picavet, who lived in Fallbrook, Calif., was known for her vibrant paintings of great racehorses, beginning her career in earnest after painting Landaluce after the filly's 1982 death. More recently, her subjects have included Zenyatta, Sunday Silence, Free House, and Candy Ride among many other California fan favorites. According to her online biography, Picavet was born in Paris and grew up riding show horses before moving to Chantilly, where she galloped Thoroughbreds. Picavet moved to the United States and was galloping for trainer Charlie Whittingham just before she retired from the saddle and focused on painting full-time. She studied under Western artist Howard Terpning and had her work displayed in a one-artist show at the International Museum of the Horse in Lexington, Ky., in 2004. Picavet's work has appeared in museums, books, racetracks, and magazines worldwide. This entry was posted in People and tagged charlie whittingham, Christine Picavet, sunday silence, zenyatta by Paulick Report Staff. Bookmark the permalink.